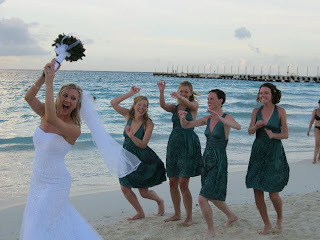 The funniest part of my wedding reception was hearing my mother shriek, “Mandy Nooooooo” as I gleefully sprinted into the ocean with my bridesmaids, brother and groom for the finale of our wedding reception. Yes I had to sprint because any slower and my mother would have caught up and intercepted the “Trash the Dress” ceremony. I hadn’t considered trashing my dress until about 10pm the night of my wedding. 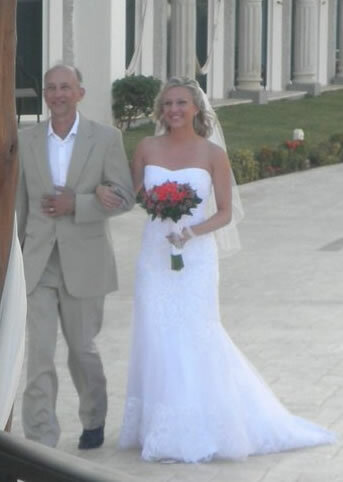 In fact, I had seen a woman on the beach the day before trashing her dress and my mother and I rolled our eyes and agreed I would NEVER do such a thing to MY wedding dress. But the problem was that my reception was ON the beach . . . the ocean right next to us the whole night. 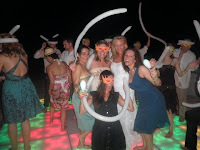 The light up dance floor was literally 20 feet from the crashing waves taunting us, begging us to take a dip in our wedding attire. Mid-reception it dawned on me that I will never wear this wedding dress again and I must take advantage of the moment. After a few “Tequila Boom Boom’s” and overhearing my bridesmaids planning their ocean foray at 10pm, I instantly intercepted the conversation and requested the ocean plunge be pushed to 10:30pm, for the last song of the night. Let’s face it; the reception must end once the bride trashes her dress. Go TIME. As it was the culmination of the greatest day my life, I will never forget splashing around the ocean with my groom, bridesmaids and brother. 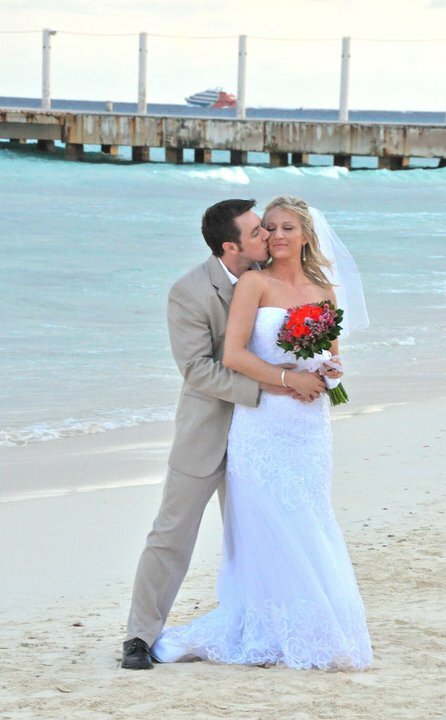 There was something so fun and devious about swimming in the ocean in my wedding dress. I will cherish that moment till my dying day . . .and yes, thankfully my mother has forgiven me. Love you mom!! 10. The pyramid photo where Mindy impressively did the splits in the sand, in her dress!!! 8. Smashing wedding cake into my husbands face, teeehee. And him not grabbing enough cake for payback. 5. The waiters operating the flashing light-up bubble dispensers and waving them across the dance floor for ‘effect’. Magical . . . yes, magical embodies the night exactly. Looks like you guys had a great time! Just by chance where did you guys get married? The photo of the guys walking on the sidewalk looks amazingly like the hotel where we stayed for our honeymoon. The hotel is The Royal, Playa del Carmen. In looking at your photo . . . it looks like the SAME hotel. Wasn't it amazing, seriously - - I would recommend that hotel to anyone for a wedding or honeymoon. This looks awesome! What great pictures. 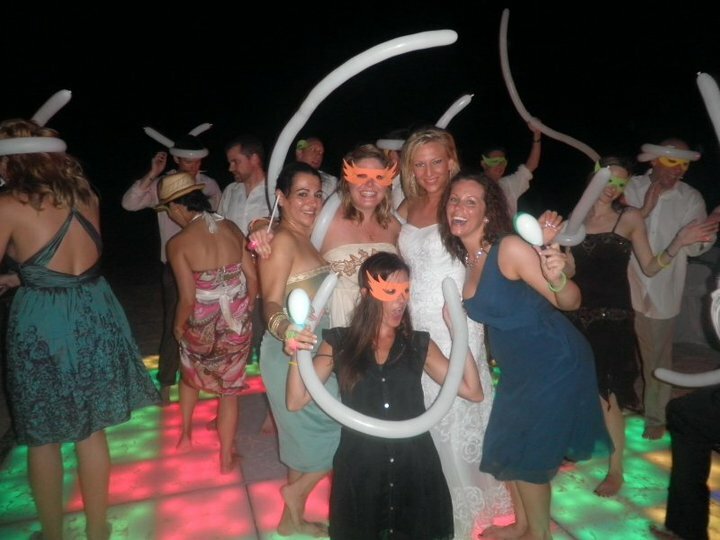 This looks like the most fun wedding ever, for real. Congratulations! <3 this post. Now show me how to cook a turkey! Mrs. Mandy! !You look beautiful and the pictures are AWESOME. Billy looks so handsome! So happy for you you both!!!!! Mandy, what a small world. We meet up in middle school - lose touch for many years after high school. And then through the wonderful world of the Internet we reconnect only to find out that a few short years apart we spend our honeymoons at the same hotel! I enjoy reading your blog. The best of luck to you in the culinary journey.